What can I say, I’m drawn to colors that pop, to produce that is as vibrantly colored as it is tasty. After months and months of cream-beige-brown food (with the occasional deep green or orange thrown into the mix), the reappearance of spring green at the farmers’ market, of tender shoots and tiny leaves, has me feeling hopeful. We’re far from September’s splashy abundance, but in some ways, I prefer this time of year – you choose one or two beautiful ingredients, treat them well, and you’re all but guaranteed a good meal. 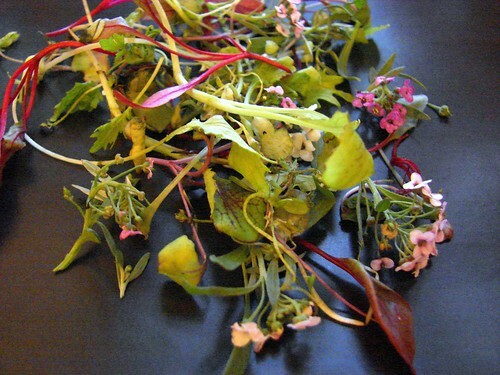 Which brings us to these microgreens, a lovely combination of baby leaves and blossoms, spicy, peppery, utterly bewitching. They make a lovely salad with a spritz of champagne vinegar, salt, pepper, and the barest drizzle of your very best olive oil. They also make a beautiful bed for deviled eggs. 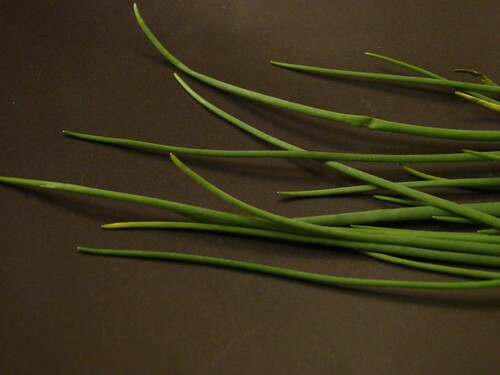 I’m a little in love with these willowy chives, too, with their gentle onion flavor and their crisp green hue. Peas won’t come in around these parts until mid-June or so, but I had some in the freezer from last summer, so I decided to build a stuffed pasta dish. I thawed the peas and pureed them with a little crème fraiche, plenty of chives, some cream cheese and soft fresh goat cheese, then I piped the mixture onto sheets of freshly rolled pasta, folding and pinching and then cutting them into agnolotti. The agnolotti bathed ever-so-briefly in boiling salted water, then I carefully placed them into a pan of melted butter with a healthy hit of lemon juice added, plus a splash of the pasta water to bring it all togther. 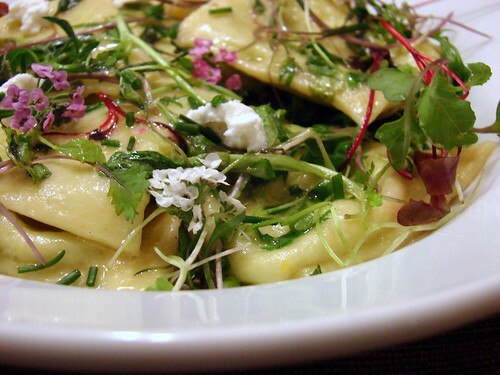 I added a couple of handfuls of those beautiful microgreens to the pan off the heat, gently tossing them with the pasta and lemon-butter sauce, then I divided the agnolotti, greens, and sauce between our bowls. A few more fresh chives snipped on, a little lemon zest, a crumble or three of goat cheese, and our pretty plates were ready. Ok, yum! I am the same way…I made a salad with violets from my lawn yesterday and it made me extremely happy! As always…divinely elegant…especially for a weeknight! I must once again say that you really should…no…this time, I beg…please, please, please….write a cookbook!!!! 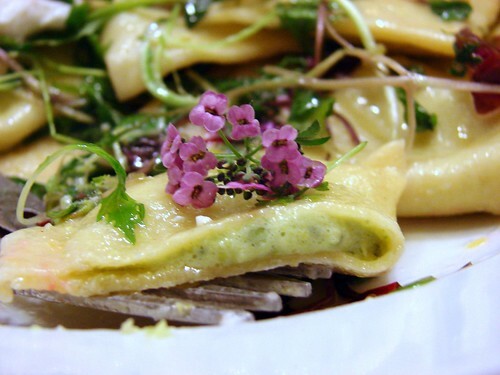 Edible flowers can be wonderful, one of my food revelation moments was garlic flowers sprinkled on a young spring lamb dish. Pretty, and with a distinct but gentle garlic flavour, perfect for spring lamb. Wow, this looks…. well, epic. 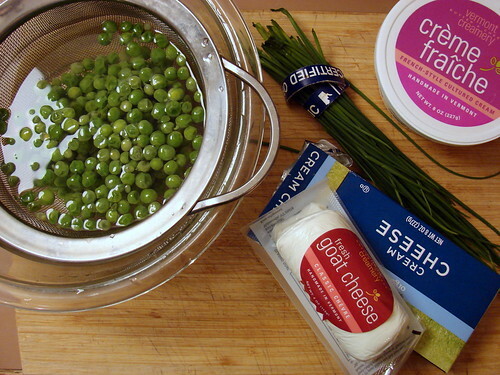 What a beautiful springtime pasta dish. Is it Sunday yet? I need to make this for Sunday dinner. Geez Louise Jen, this looks freaking fantastic. Seriously, I know it’s not legal or anything (at least in PA, harumph) and also, you’re taken, but will you marry me? Or, the very least you can do is move to Philadelphia and be my neighbor. I’m off to go harass the husband into finding employment in Rhody. Wow. That is beautiful. My mom used to put flowers from our yard in salads, I think it is about time they make a comeback. This looks so interesting and yummy. And for some reason, it got me thinking about zucchini blossoms. Is that something you have ever tackled and if so, will you please share this summer??? As always, thanks for the inspriation to cook something healthy and delicious. that is really gorgeous looking! i will try find some similarly pretty flowers at the farmers market tomorrow so i can do something so lovely looking myself!! Sounds breathtakingly delicious. The flowers look like brassica family…kale, rabe, collards? Christine – your comment cracked me up! Marie – you’re the flower expert, not me 😉 They look similar to the blossoms on some flowering thyme we brought home last year, so that was my first thought, though you may be right that they’re from brassicas. I’ll see what I can find out on Saturday. I can’t remember if I’ve ever commented, but I’ve been reading your blog for a long time. I really love to come here and be inspired to just cook some good food, drink something delicious, and enjoy life. So interesting. I think the flowers are Dame’s Rocket: someone just left a comment on my blog about them. They are highly invasive and considered a noxious weed, but are a popular garden flower. I had no idea. They do belong to the mustards/brassicas – which accounts for their peppery taste. I saw your lovely photo, and before I even read a word of the post my first thought was “How pretty!” Looks lovely on so many levels. Hello, Spring!